“This is the piece by which I would like to be remembered,” he told his students. Carved in North Haven granite from the island he loved, the mature artist, Frederick Warren Allen, had finally found his best expression. Solid and heavy like the stone, possessing strength at it’s core and emotional power in it’s expression, stripped of excess, pared down to the elements of sculptural design as he taught it, refined in it’s details; simple, balanced, elegant, finally perfect in his eyes. 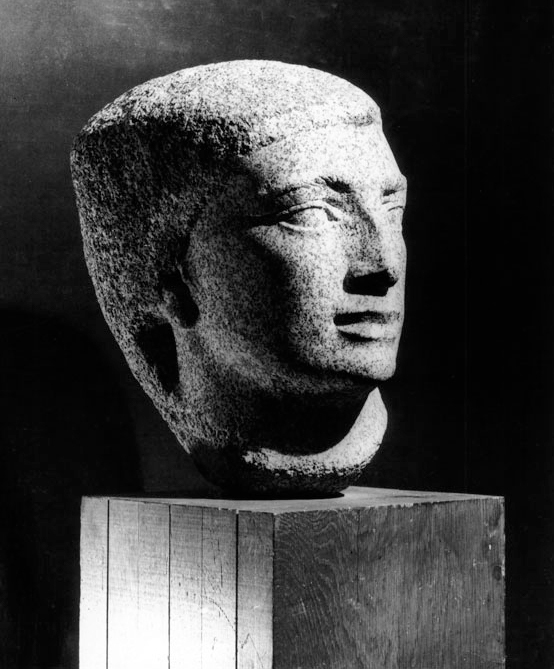 Described in American Figurative Sculpture by Greenthal as “massive and impressive,” Egyptian Head was on display in the 1939 Worlds Fair, praised as one of the twelve best sculptures exhibited. It is now owned by the Smithsonian American Art Museum in our nation’s capitol. The above comments present the feeling that this head has evoked from those who have viewed it. Here are some additional objective observations. The head is what is called “heroic,” which, related to sculpture, means larger than life, but not monumental in size. The carving was done on a boulder brought up from the North Haven beach, which his mind’s eye already saw as a strong masculine spirit within the stone. The height of the head is 15.5 inches on a 7.5 inch base, a total of 24 inches. 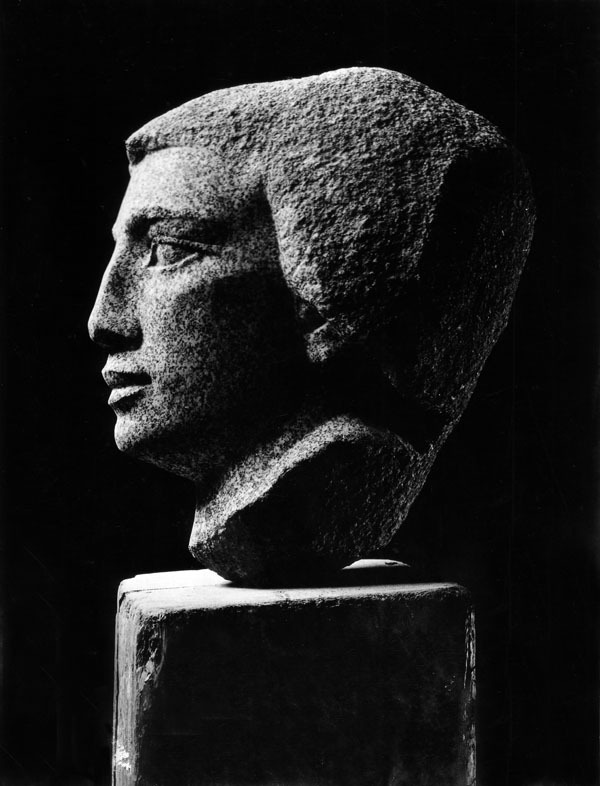 Also of historical interest is that the Smithsonian, when offered the choice of the Egyptian Head or Nydia (now at Concord Art Association), had consulted with a member of their Art Commission, the well-known sculptor and teacher, Walter Hancock, who was locally connected to New England by the studio he kept in Gloucester, MA. He chose the Egyptian Head, and the Art Commission in the end reached a consensus and approved his choice. The head is wide at the crown, narrowing down under the base of the skull to balance perfectly on a short thick neck. 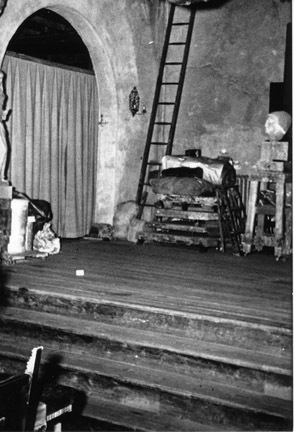 The work can be seen in its beginning stages mounted on a large block, high on a work stand on the skylit stage of his Tavern Road studio. The shape of the skull has been determined, leaving the weathered shell like a hat. Here he has been working on the details of the face and has cut away some of the stone to clarify the hairline at the level of the neck. He has also begun to give shape to the jaw. In profile, the man has a pleasingly strong nose, flat and wide at the bridge between thick eyebrows, but nicely shaped at the tip and nostrils. The eyes are large, almost almond in shape and set wide apart. The mouth is generous and the lips full, set in a peaceful straight line with the corners neither turned up, nor down. The chin is not prominent and the forehead is not high. The lobes of the ears are just barely visible under the thick mat of hair that covers his head and the back of his neck. The original darkened surface of the stone is still showing where it curves upward from the base, surrounding his neck like a collar. It is a balanced and handsome face. Perhaps on display it would have presented a better-unified whole if the block that held it if it were darker. 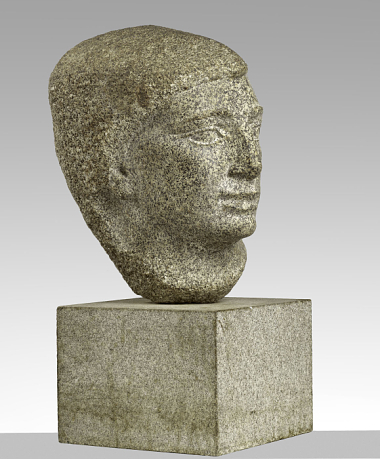 The Egyptian Head remains heroic and Frederick Allen’s most powerful work of art.